You are browsing the archive for Tropics. Blue Color Shows Cooler Waters Exactly Where Igor Tracked! 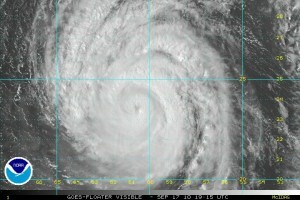 Hurricane Igor was a large hurricane with a category four intensity at its peak. If there was ever any doubt that tropical storms and hurricanes are fueled by warm ocean water, take a look at this image! The image is Sea Surface Temperature Anomalies. Simply put, it is water temperature where cooler than normal is shown in blue and warmer than normal in orange. The track of Hurricane Igor is obvious by the arc of deep blue which points right at the black dot representing Bermuda, which Igor struck on Saturday, September 18th 2010. Hurricanes make use of water ocean water as a source of energy. The warm water evaporates and then condenses again in the thunderstorms which make up tropical weather systems and in the process, release the heat energy back into the air, making the thunderstorms even stronger. When a particularly strong and/or large storm like Igor passes through, a trail of cooler water is often left in the wake of the storms’ path. Tropical storm Matthew formed in the southern Caribbean yesterday. The big question is: where is this storm headed? This storm has an interesting future. It’s path will be affected greatly by the development of a “cut-off” low in the upper atmosphere early next week which should be sitting over the Mississippi Valley. This feature might not ”grab” Matthew pulling it north. Rather, it will probably cause this storm to sputter and stall around the Yucatan. But the exact development of cut-off lows is always a challenge for computer models so the interaction is proving to be convoluted. Adding more confusion, there seems to be several areas of low pressure in the Caribbean vying to develop into a tropical storm over the next week to ten days. It should be interesting to see which if any of the systems can achieve hurricane status and effect the mainland U.S. This is really a follow-up to a post from last week in which I highlighted a possible hurricane affecting the mainland U.S. toward the end of the month which is late next week. Well, the possibility is still there. The latest computer model run puts this storm near Florida around October 1st, a tad later than I had discussed. Now, one should never believe in the exactness of any one computer model run especially this far out. This same storm was shown last Thursday hitting New Orleans and has been spotted on recent computer model runs near the Yucatan. But the point is it has consistenly shown up in model projections. Today, it is a wave or area of disturbed weather which has been identifed by the National Hurricane Center over the south-central Caribbean. Low latitude (closer to the equator) storms such as this have the same two fates as all: to barrel westward into Mexico (possibly crossing into the Pacific Ocean) or to make an eventual turn north. It is deciding which path this developing storm (Matthew is next on the list) will take that is the question today, its development seems a lot more certain. But the low latitude makes it a tad more likely that storms “making the turn” will do so in a way which impacts the United States. I enclosed projections from various computer models in this post from Wednesday AM. More updates later to be sure. Remember, you can check out a rather neat page dedicated to this developing storm on the drop down menu item “Tropics” above! ADMIN UPDATE8:45 pm 9/22/10: Latest GFS run insists on putting this storm near eastern Florida and then follows it by another storm around October 5-6. Bermuda is under a hurricane warning as strong and large hurricane Igor moves in this weekend. Sustained winds at this writing were at 105 mph with gusts to 127 mph making Igor a category 2 storm on the Saffir-Simpson scale. Igor is a large hurricane with tropical storm-force winds extending out 345 from the center of the storm. Bermuda International Airport will be closed on Sunday and Monday because of the approaching storm. According to statistics compiled by HurricaneCity.com, the island of Bermuda can expect a brush or hit by a tropical weather system approximately every 2.5 years. Be sure to check out the Tropics menu above for a fantastic tracking map for Igor and a list of useful links including one for a doppler radar on the island of Bermuda. After weeks of watching powerful hurricanes largely miss the mainland U.S., could the Gulf of Mexico catch one late this month? I’m typing this as three hurricanes churn in the Atlantic basin. Julia is the farthest east. Igor is still powerful and quite large and still threatens Bermuda this weekend. Karl is has crossed the Yucatan Peninsula and is now a hurricane. Pictured below are surface pressure forecast charts from three runs of the GFS model on Wednesday. All show a strong hurricane with obvious differences in position. The question is: will the hurricane form and it is just a matter of pinpointing where? It’s still too far out to know. But confidence that something will happen does build when consecutive runs of a computer model continue to indicate a storm. These are all maps valid at about 7 pm on September 28th. Runs of the model I have checked today continue to show something in the Gulf of Mexico around the 28th or 29th. Again, the details of intensity and the exact position need to be thrown out at this distance. But I’ll bet a storm shows up!